Imagine the scene. You have your ‘badge, or credentials’ – the American phrase for entrance ticket – and you arrive outside the closed gates at 7:15am. The gates open at 8:00am, not 7:59 or 8:01, but 8:00. 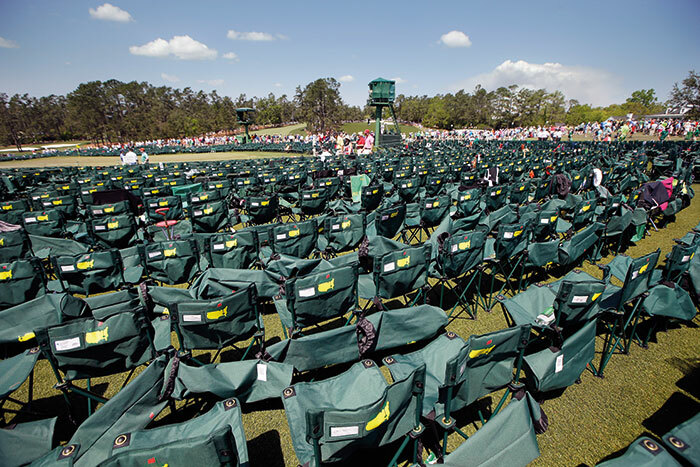 You are armed with what you need for a whole day at one of the most iconic events on the sporting calendar and that includes a folded-up chair. It has to be folded up, with no rigid arms. In South Africa we’d know it as a camping chair. Those gates – imagine this one being Gate A on Berckmans Road – swing open and the race is on. No running, mind you. It’s a race to get to your favourite hole where you can place your chair in a spot and then leave it unattended. You can come back hours later and that empty chair is still there, just where you placed it. Rules are rules at Augusta National and here’s a list that will leave you wondering just how you will survive a full day without being escorted, pronto, from the venue. No standing in officially designated sitting areas. No sitting in the standing areas. No carts. No lying down anywhere. No fanny packs [moon bags] larger than 10 inches wide, 10 inches high or 12 inches deep. No selling a Masters badge within 2 700 feet of an Augusta National gate. No membership application process (by invitation only). No tipping on the grounds. 0 – No golfer has won the Par 3 Masters event (launched 1960) and the Masters itself. Nearly a third of the Par 3 winners have gone on to miss the cut. Two players have been runners-up : Ray Floyd in 1990 and Chip Beck in 1993. 2 – South Africans who have won the green jacket in the past decade – Charl Schwartzel in 2011 and Trevor Immelman in 2008. Gary Player won it three times before that. 4 – The number of albatrosses (two on a par five) in history: Gene Sarazen (1935), Bruce Devlin (1967), Jeff Maggert (1994) and Louis Oosthuizen (2012). 6 – Jack Nicklaus holds the record for the most Green Jackets – 1963, 1965, 1966, 1972, 1975, 1986. 7 – Consecutive birdies on the Augusta layout, scored by Steve Pate in 1999 and Tiger Woods in 2005. 12 – The largest margin of victory, when Tiger Woods ran away with the tournament to win his first Major trophy in 1997. 13 – Not a good day at the office for Tommy Nakajima in 1978 and Tom Weiskopf in 1980 when both golfers took 13 shots to finish a hole. 14 – The age of the youngest competitor, and youngest golfer to make the cut. Guain Tianlang was just 14 years 4 months and 19 days in 2014. 18 – Until last year’s heroics by Jordan Spieth, who also shot 270 to win, the only previous person to go 18-under was Tiger Woods in 1997. In 1965 Jack Nicklaus shot 16-under, as did Ray Floyd in 1976. 21 – The age of the youngest winner – Tiger Woods in 1997. Reigning champion Jordan Spieth was just five months older, also aged 21. 28 – Birdies shot by Jordan Spieth in winning the 2015 Masters. In 2001 Phil Mickelson had 25 birdies, and there were 24 birdies scored by both Jose Maria Olazabal (1991) and Tiger Woods (2005). 46 – The age of the oldest winner – Jack Nicklaus – in 1986. For the record he was 47 years 2 months 23 days. 52 – Gary Player has made the most appearances in the Masters. The South African ended two ahead of Arnold Palmer (50). However, Palmer played for 50 consecutive years. 63 – Nick Price in 1986 and Greg Norman in 1996 both shot record low rounds at Augusta. 95 – A record you don’t want. In 1956 Charles Kunkle shot 23-over par. In 1997 and 2000, Doug Ford shot rounds of 94.